I have, believe it or not, Republican friends (yes -- even here in Berkeley!). None of them "like" Donald Trump, so to speak. For some, that manifests in much the same way that grouchy Sanders voters feel about Clinton -- certainly not their ideal candidate, and they're happy to give off a laundry list of shortcomings, but not manifestly distinct from any other politician on their side of the spectrum who they view as unideal. But others are very much on the #NeverTrump train, and have reacted to his nomination with a sort of staggered shellshock. They feel genuinely betrayed, completely adrift. Trump is not just an "unideal" candidate, he is the antithesis of everything that they identify with as conservatives. I do feel bad for these people. Seriously -- I do. And it's worth noting that many of them have endured appalling levels of abuse -- grotesque, threatening, vicious abuse -- for their stance. I don't want to downplay that. But I'm watching and waiting to see if they will really come to terms with the fact that Trump is their baby. Not them, personally, but he is the outcropping of specific choices that Republicans have made over the past eight years (at least). He is not a bolt of lightning. He is not an act of God. He is not (to take the most pathetic rationalization of all) a "Democrat" (there are all manner of ways I could respond to "Trump is a Democrat", but my first instinct is simply to retort "yet note how we managed not to nominate him!"). Donald Trump -- racist, xenophobic, Islamophobic, bolstered by the alt-right and trumpeted by the anti-Semites -- is what you get when you spend years playing wink-and-nod with racist conspiracy theories while loudly dismissing any objections as just "playing the race card." Donald Trump -- paranoid, conspiratorial, unwilling to straight-forwardly commit to accepting the validity of an election he loses -- is what you get when you whip up an unsubstantiated frenzy about epidemics of "voter fraud." Donald Trump -- abjectly unconcerned with facts and openly derisive towards truth -- is what you get when you convince your followers that the media, academia, empirical research, and scholarly inquiry are all thinly-disguised liberal Trojan horses. Donald Trump -- out of control, completely unconstrained by Republican leaders (to say nothing of basic norms of decency), standing at the head of a movement that seems ready to burn it all down -- is what you get when you gleefully celebrate your base taking on the characteristics of an establishment-smashing mob. It was very clear that many Republican elites thought they could tap into these sentiments and keep them under control. They convinced themselves that "everyone" knew it was rhetoric, it was hyperbole, it was red meat, it wasn't serious, it wasn't representative, it was only a few rubes or hot-heads who actually believed it. Until it wasn't. Until it turned out that most of the base did believe it. Donald Trump is the fruit of a decade of Republican labor. It is easier and more comforting to view him as a divine calamity, particularly for those for whom the Trump movement -- like the Frankenstein's monster it most resembles -- has turned on them with a vengeance. But his emergence is not cloaked in any mystery. And until my shellshocked Republican friends forthrightly grapple with how Donald Trump came to be the representative of contemporary American conservatism, they will never be able to either launch an effective counterattack or -- and this might be what is necessary -- accept that the contemporary conservative movement can no longer be their home. In the middle of a paper-grading binge. That means it's roundup time! The conservative Arizona Republic endorsed Hillary Clinton. It got death threats in response. Its reply is a stirring defense of First Amendment values that deserves to be circulated widely. The Washington Post has a fascinating profile on Derek Black, a young man who was raised in the White Supremacist movement and was considered a rising star in that community, who has since come to repudiate his old beliefs. The turning point was when -- after his racist affiliations became known to his college classmates -- an Orthodox Jewish classmate took it upon himself to invite Black to Shabbat dinners. It's a beautiful and touching story about how courageous acts of kindness really can make a difference even in very dark places. The recent UK parliamentary report on anti-Semitism is a masterclass on how its done. It begins by adopting the MacPherson principle (that the starting point for when something ought to be deemed racist is when a member of the targeted group perceives it as such) for when it is appropriate to consider an anti-Semitism claim, which is correct; it then observes that more than just subjective sentiment of the aggrieved party is necessary to sustain a complaint of anti-Semitism, which is also correct. As Anshel Pfeffer put it: "British Anti-Semitism Report Declares War on ‘Goysplaining.’" I highly encourage everyone to read it in full. Someone just sent me a link to Unite for Palestine, which is basically the internecine (and inverted) version of the Canary Mission -- an attempt by one wing of pro-Palestinian activists to name-and-shame anyone in their movement who is too concerned about anti-Semitism. JVP is a favored target, which is deliciously predictable. "First they came for Assange." Then, maybe, they'll come for some other accused sexual predators. We can only hope. UNESCO formally adopts resolution denying Jewish connection to its own holy sites. In conclusion, it's inexplicable why the Israeli government doesn't heed UN resolutions which are only interested in attaining peace and justice throughout the region. Saban says he still believes in a two-state solution, but his all-consuming concern is defending Israel and fortifying its relationship with the United States. "For me," he said several years ago, "bringing the American president closer to the people of Israel is a life goal." One year at the Saban Forum, an annual conference featuring top officials and public figures from the United States and Israel (with the odd Arab leader), the mogul outlined his three-pronged approach for influencing American politics: fund political campaigns, bankroll think tanks, and control the media. In addition to the Saban Forum, he funded a Brookings Institution research center focused on US-Israeli relations. He has tried for years to buy media outlets in the United States and Israel; it wasn't a profit he was after, per se, but "a return with influence," as he once told a journalist. [Saban] remains keenly interested in the world of business, but he is most proud of his role as political power broker. His greatest concern, he says, is to protect Israel, by strengthening the United States-Israel relationship. At a conference last fall in Israel, Saban described his formula. His “three ways to be influential in American politics,” he said, were: make donations to political parties, establish think tanks, and control media outlets. In 2002, he contributed seven million dollars toward the cost of a new building for the Democratic National Committee—one of the largest known donations ever made to an American political party. That year, he also founded the Saban Center for Middle East Policy at the Brookings Institution, in Washington, D.C. He considered buying The New Republic, but decided it wasn’t for him. He also tried to buy Time and Newsweek, but neither was available. He and his private-equity partners acquired Univision in 2007, and he has made repeated bids for the Los Angeles Times. Huh. Yes, I'd say "familiar" is one way to describe the relationship between those two passages. (The New Yorker profile is mentioned -- but not linked to -- once much deeper in Kroll's essay, on an unrelated point). That's probably the most stark overlap, but by and large Kroll's piece reads as basically a slightly rewritten and updated rehash of Bruck's older profile. While we're on the subject, I remain curious about the "control the media" line. Obviously, "politically active Jewish billionaire says he wants to 'control media outlets'" is rather fraught territory to tread on. It would be one thing if Saban actually said as much -- and hey, brash Hollywood executives have been known to say alarming things -- but you'll note that it isn't actually placed in quotations (the "three ways to be influential in American politics" are apparently a direct quote, but the actual list is Bruck's paraphrase). Kroll doesn't give a source for his own paragraph -- it certainly seems to track Bruck's closely -- and now we have two sources attributing to a powerful Jewish figure a desire to "control the media" without any indication of what, precisely, Saban said. And again -- maybe he did use the word "control". But the lack of a direct quote here is noteworthy given the decision to describe his position in terms that smack of a classic anti-Semitic trope. If Kroll -- who matter-of-factly describes Saban's "divided loyalties" in his very third paragraph -- has a direct quote from Saban wherein he says he wants to "control the media", he should provided it. If he simply is cribbing from Bruck's prior work, he should say so. I have no particular desire to laud or indict Haim Saban. I find him an intrinsically interesting figure for a variety of reasons (not the least of which is his Egyptian-Jewish background -- given about a paragraph's worth of relatively similar attention in both essays), but his politics are more hawkish than my own and the beneficence of his influence is no doubt mixed. But I don't think it's too much to ask that an essay holding itself out as a major piece of novel investigative journalism should do more than give a glorified update of another profile published six years ago. Sometimes, when we talk about racial injustice in America, we instinctively think about the American South. 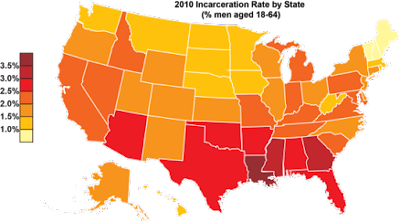 And sometimes, when trying to check that instinct, we say things like "sure, things are worse in the South -- but it's actually a problem nationwide." But it's not always the case that the South is the worst offender. 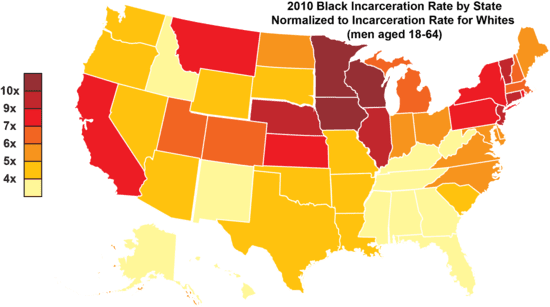 A very interesting post about comparative racial incarceration rates indicates that it may be the upper Midwest -- embodied by my beloved Minnesota -- that actually has the greatest incarceration problem. 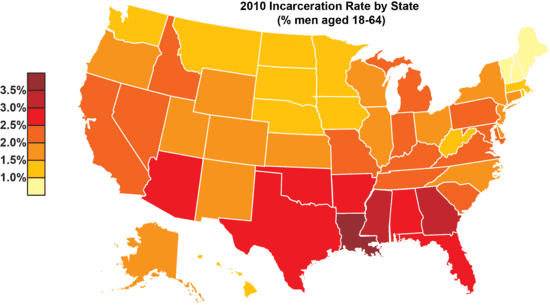 The first graphic perhaps bolsters our intuitive notions about the South -- its overall incarceration rate seems far higher than the rest of the country. But if we zoom in solely on the Black male incarceration rate, that gets blurrier. 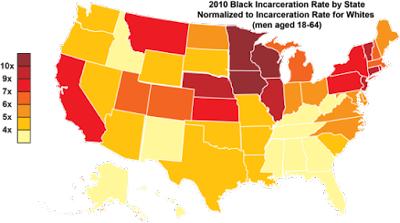 Here the evidence is more mixed: Some Southern states (Texas, Oklahoma, Louisiana) continue to do poorly -- but they're joined by states like Iowa, Wisconsin, and Pennsylvania. But even this graphic might be misleading, since it doesn't provide a comparative account of how many Black men are in jail versus their White fellows. Oklahoma, for example, seems to throw everyone in prison -- so it stands to reason that it puts a lot of Black people in prison too. 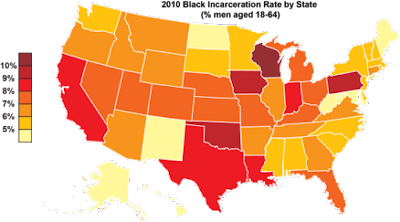 This graphic showcases the Black incarceration rate as compared to the White incarceration rate in each state. And here we can see how the center of gravity shifts decisively to the north, and particularly the upper-Midwest. 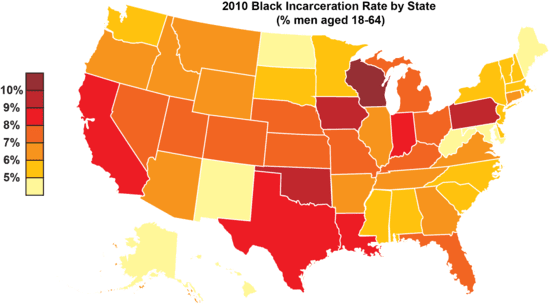 Minnesota, for example, doesn't really imprison that many people -- but if you are in jail, you're almost certainly Black (or another racial minority -- Minnesota distinguishes itself for having a massive disparity not just for African-Americans, but for Latinos and Native Americans as well). Now to be sure, we can debate whether the most important metric is the overall percentage of Black men put in prison, or the comparative Black/White figures. One could object that it is strange to excuse Oklahoma's mass incarceration of Black men by observing that it imprisons a ton of White men too. Much of the South performs "well" in the last graph simply because it has elected to pursue a mass incarceration strategy for everybody, and it's hardly a given that this decision is worth lauding. But certainly, these comparative figures are a relevant data point. And they're one where the South significantly outperforms many of its northern peer states. Those of us interested in racial justice need to own up to that.